Market Research is used to better understand your customers, define and better target and communicate with your prospects, and test and refine products or concepts for new markets, products, services, or features. 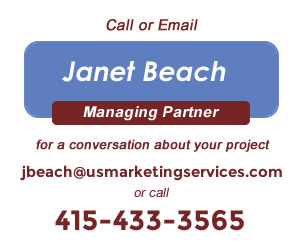 We are your marketing partners for strategy choices, messaging decisions, marketing planning and delivery of results and we base these on information gathering and custom research. US Marketing Services has successfully planned and completed thousands of interviews, focus groups, usability studies, concept tests, message tests, packaging studies, website refinement research, satisfaction tracking, and the like. Research with US Marketing Services is planned with you and we are known for the high quality of the companies and decision-makers we are able to convince to be confidentially interviewed by one of us. The insights we deliver are superior and have long-term value for you and your firm. We also can do quick and small research studies for you using the same care we put into larger efforts.